Southport’s performance advantage is a result of offshore racing technology combined with custom hull designs from the naval architectural firm of C. Raymond Hunt Associates, famous for their development of the deep-V hull which revolutionized the development of fast powerboats in the 1960s. Today, they continue to use their expertise to innovate and develop new designs. Using a light, strong composite structure, the marine architects at Hunt balanced the weight of modern dual outboards with a wider aft stance and deeper continuously variable v design. Southport’s hull actually benefits from the weight of the dual outboards because these designs carry a sharp v aft on a wide stance, adding crucial buoyancy, and the broad aft chine areas are held firmly in place by the engine weight. The result is a wide, stable platform with a 22-degree deep-v aft that rapidly increases to the mid 30’s amidships and a very fine forward entry. No other hull designs combine Southport’s soft ride and incomparable stability in a single boat. In just a few short years, the Southport ride has become a legend in fishing circles around the world. Your first Southport ride will be a memorable experience: smooth, responsive, and exceptionally quiet. But perhaps the most surprising performance feature is that even in a seaway with a beam sea, spray is practically non-existent. In most sea conditions, even challenging ones, prepare to be astonished at how well the sharp strakes control the water flow. The formula for the dry ride of a Southport lies in the knife-like sharpness of the strakes combined with the straight hull sections of a continuously variable v hull design. It is always an unbroken line from the keel to the chine, the Hunt4 Design hull directs water out and away from the boat, rather than up and over the gunwales, like many other hull shapes. You can actually see three waves generated by the hull at speed from each of the strakes and the chine, as the Southport hull attacks and controls the seas. An amazing range of economical cruising speeds — from 25 mph to 40 mph. Most hulls have a narrow band of maximum economy, usually over 30 miles per hour. But because Southport hulls use the weight of modern outboards for balance, they reach a planing attitude in seconds and easily maintain the planing attitude in the lower 20’s. Of course, the soft ride of a Southport hull will tempt you to run fast in most sea conditions. But it’s comforting to know that on those days when skipping over the tops isn’t a viable option, you can efficiently cruise in the mid 20’s comfortably and safely. When the conditions permit, see what she will do. But when it really gets tough, you and your crew will appreciate that you can ease off without getting knocked off plane by the sea conditions. An incredibly diverse experience base combined with the functional fishing knowledge of the Southport design team resulted in a well-configured, safe interior with numerous features that the avid fisherman and casual boater will appreciate. 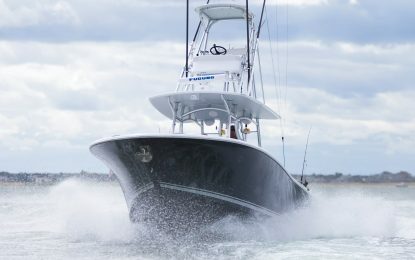 All Southport models feature deep, safe cockpits with a single level sole from bot to stern, aggressive non-skid decks, recessed stainless steel grab bars and abundant storage for gear, fish, and beverages. Inside a Southport, you’ll find electrical systems designed in a yacht-like manner, scuppers that evacuate green water like a custom sport fish and ergonomically designed components that provide comfort all day long. Perhaps the most important element of a Southport’s design is passion. We firmly believe that great boats demand great talent, great materials, and a passion for excellence that creates an extraordinary ownership experience. Built by Maine Craftsmen, the MAINE WAY. From design to construction, all Southport boats are built to ensure that our clients Experience Excellence.